In this post, I'd like to connect a specific area of my expertise?electronic voting (e-voting)?to issues of interest to the legal information community. Namely, I'll talk about how new computerized methods of voting might affect elements of direct democracy: that is, ballot questions, including referenda and recall. Since some readers may be unfamiliar with issues related to electronic voting, I'll spend the first two parts of this post giving some background on electronic voting and internet voting. I'll then discuss how ballot questions change the calculus of e-voting in subtle ways. The images of officials from 2000 closely scrutinizing punchcard ballots during the U.S. presidential election tend to give the mistaken impression that if we could just fix the outdated technology we used to cast ballots, a similar dispute wouldn't happen again. However, elections are about "people, processes, and technology"; focusing on just one of those elements disregards the fact that elections are complex systems. 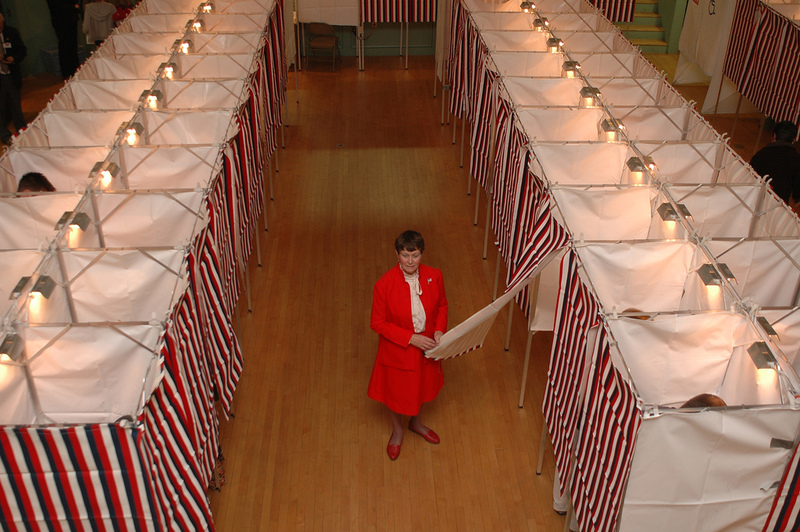 Since 2000, the system of election administration in the United States has seen massive reform, with a lot of attention paid to issues of voting technology. In 2007, California Secretary of State Debra Bowen commissioned a review of California's voting systems by a team of technical experts, of which I was one. She released many of the technical reports on the night of 27 July 2007 and then spent a week studying the results before issuing her decisions at a late night press conference on Friday 3 August 2007. It's a visceral, thoughtful piece of voting systems history that particularly highlights how careful, conservative and scientific Debra Bowen thinks and adjudicates. Below, I include the full transcript from the event... (I've posted those in HTML and TXT, as transcribed by the wonderful CastingWords.com). Debra Bowen: I don't want to wait any longer. It's been a long evening as it is. So, good afternoon or evening or whatever it is. It reminds me a little bit of our old budget negotiation days. Apologies for the delay. Believe me, it was not by design. Before I announce the actions that I have taken this evening, I want to talk briefly about the decisions and something about the rationale behind them. The systems that we use to cast and tally votes in this state are the most fundamental tools of our democracy. And if, in this great nation, we do not have confidence, our citizens do not have confidence that elections have been correctly decided because they do not have faith in the integrity of the tools used in the conduct of elections, then elections officials have a duty to investigate the source of citizens concerns and a duty to take remedial action. A democracy cannot long remain a democracy if a substantial number of its citizens have lost faith in the electoral process itself. I take my responsibilities as this state's chief elections officer very seriously. I am mindful of the impacts that my decisions will have on voters, on county and local elections officials, poll workers, voting system vendors, and on others in California and across the nation. Every county's election results have consequences for the citizens of every other county. Every state's election results have consequences for the citizens of every other state. And every nation's election results have consequences for all of the people of the world. That's the nature of our independent world in the twenty-first millennium. Today, I want to tell you about an interesting encounter I had with my iPad over lunch. I'm a sucker for pizza, and Princeton has a particularly good Pizza place near CITP, Old World Pizza. Stranger: Oh, hey, is that thing connected to your computer at home? Stranger: Oh, so that thing is a computer? Me: It's an information appliance. Stranger: Oh, that makes sense! Me: Yeah, it's great for reading, listening to stuff, watching videos, etc. Other Stranger: Hey man, [talking to Stranger] what did you want to know from the phone? Stranger: How many acres were there in the Louisiana purchase. Other Stranger: Oh, are you looking that up? Other Stranger: Cool, probably won't take you as long. At this point, in a total of about 20 seconds, I open Wikipanion on the iPad, look up "Louisiana Purchase", find that it's 828,800 sq mi., copy that, paste it into Pcalc for iPad and convert it to 21.47 billion ares. Other Stranger: Yeah, I said billions. Stranger: Wow. We got that for the equivalent of $11 million. Other Stranger: That's a hell of a deal. As part Hispano -- my decendents were in what is now New Mexico and Colorado before México existed -- this was particularly strange: two guys marveling at what they considered a real estate transaction which was an event of enormous historical proportion for the USA. I get the impression that "information appliance" is a useful and accessible name for this class of devices. I messed up and gave them the figure in ares instead of acres. I didn't know what an are is... so, I didn't notice I had misread the conversion; the correct answer is 530,432,000 acres. The real figure is about $15 million (according to Wikipedia), which includes some debt we forgave France. In 1803, $15 million was worth much more than $15 million now... using estimated consumer price index correction factors for 1803 of 0.052 from Robert Sahr, it turns out this was about $290 million, or about $0.50 per acre. I replaced my iPhone (2G) battery today, and it was much easier than I expected. Don't get me wrong: it is far from easy. However, with some patience, the proper tools, and a good technical grasp of the process and the skills involved, it's not as hard as it might first seem. soldering on the new battery. Purchase a battery and case opening tools off of eBay. I bought this battery and tool pack from yallstore for $7, who ships from Brooklyn. You'll need some additional tools, including a #00 philips head screwdriver and a dental pick. I don't recommend the metal spudger that iFixit uses; the two iPhone case opening tools that come with the battery and a dental pick are perfect. You'll also, of course, need a soldering rig with solder iron, solder, desolder braid (or a vacuum pump), etc. and the smarts to use it well without making a mess. I used the Bleeding Edge's method for getting the case off but decided to be a bit more careful, like iFixit, with removing the old solder and soldering on new joints.